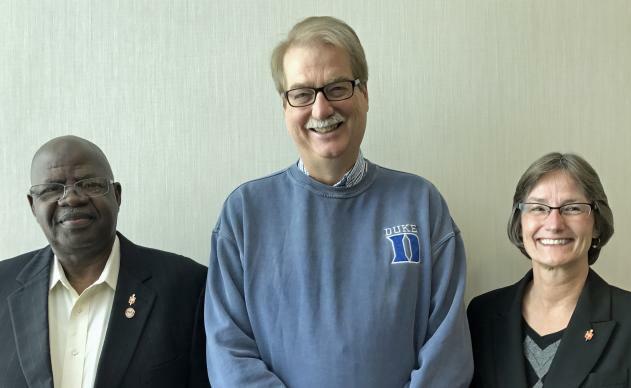 Bishops David Yemba, Ken Carter and Sandra Steiner Ball (left to right in photo below)- the three bishops serving as moderators of the Commission on a Way Forward - met Nov. 17-18, 2016 to continue the planning process of the Commission's work and offered the following progress report. Our hope and prayer for The United Methodist Church is that we will be united and vital, missional and global. As we began, we discussed a number of practical matters, beginning with visas for our international members. We took into consideration issues of security and confidentiality, with the need to build intimacy and trust among commission members, and the corresponding desire of the whole church for consistent information and updating of the progress of the commission. We recognize that we do our work within this tension. We plan to integrate the values of inclusiveness as we shape the covenant by which we will do our work. And we are committed, at the conclusion of each meeting, to be available for questions and answers and to provide a summary of the outcomes. We plan to offer consistent communication in collaboration with United Methodist Communications (UMCom). A website (umc.org/wayforward) includes the original proposal passed at the General Conference in Portland, Oregon; the mission, vision and scope of the commission’s work; and information about the commission members and moderators. Soon additional items will be added including recommended readings and the contributions of conversation partners across the denomination. We plan to create contexts in each Central Conference and in the United States that will include listening to diverse voices and gaining input. An email address specifically for the purpose of gathering questions and generating ideas will be established and is to be located on the website. As a practice of Christian stewardship, the majority of the meetings will be held in United Methodist facilities. And as an expression of our global nature, one of the meetings will be held outside of the U.S. We also discussed the ways in which the Commission’s agenda is related to the work of several other bodies, including Council of Bishops, the Committee on Faith and Order, the Standing Committee on Central Conference Matters, and the Connectional Table, and our need for collaboration with these leaders. We have asked Commission members to prepare for the first meeting by reading the following resources: “Wonder, Love and Praise," from the Committee on Faith and Order; The Anatomy of Peace (Arbinger Institute); and “Be Strong and of Good Courage” by Gil Rendle (Texas Methodist Foundation). The commission members will participate in a conference call in December, and the first official meeting will take place in January, in Atlanta, Georgia. We plan to meet approximately every six weeks to two months. We concluded the meeting by reading Colossians 1. The Apostle Paul reminds us that Jesus Christ is the head of the church and that in him all things hold together; that through him God was pleased to reconcile all things, making peace through the blood of his cross. We prayed for each commission member by name, and for faithful and fruitful work that will be a blessing to the people of The United Methodist Church and our mission with all people. We ask for your prayers; indeed, we depend upon them. God is faithful.